When it comes to the construction industry, all the workers must be skilled, qualified and competent. Imagine if everything they built can be damaged easily – buildings, roads, highways or other immovable properties. That is why it is important for them to employ only the skilled ones to assure safety and quality of the structures. Various schemes were introduced in order to cater to the different needs of the construction industry. 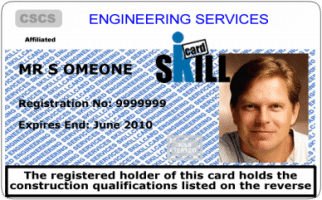 One of this is the SKILLcard, an industry-recognized card issuing and personnel registration scheme for those working in the mechanical sector of the construction industry in UK. 1 What is a SKILLcard? 1.1 What are the benefits of having a SKILLcard? 1.2 What are the occupations covered by the SKILLcard? 1.2.1 What are the different card categories under the scheme? 1.2.2 How do I apply for a SKILLcard? The Engineering Services SKILLcard is a scheme designed for individuals working in the mechanical sector of building services engineering industry. This is important since most industries today require that its workers be skilled and qualified as evidenced by a card bearing its qualifications. What are the benefits of having a SKILLcard? What are the occupations covered by the SKILLcard? The scheme covers 3 categories – Craft & Operative, Supervisory, Management & Professional and Construction Related Occupation. Craft & Operative includes Commissioning Engineer, Duckwork Erector or Duckwork Installer Gas Fitter, H&V Fitter, Plumber, Refrigeration / Air Conditioning Technician or Engineer, and Service and Maintenance Assistant among others. Supervisory, Management & Professional occupation consists of Contracts Manager. Design Engineer, Foreman, Project Manager, Quality Surveyor and Service and Maintenance Manager among others. Lastly, Construction Related Occupation includes ACRIB refrigerant handler, Building Controls Engineer, Coldroom Installer, Dust Extraction System Installer, Fume Cupboard Installer, Humidification Engineer, Medical Equipment Installer, Pipefreezing Specialist, Trace Heating Systems Installer and Ventilation Hygiene Specialist among many others. What are the different card categories under the scheme? SKILLcard has various categories when it comes to issuing their cards. Each card represents a certain level of expertise that is different from the rest. Let’s take a look at the different card categories. This 5-year, non-renewable card is ideal for those who have no qualifications yet such as Student Engineer or Commissioning Trainee. Best for those who have completed or still studying in order to complete Building Services Engineering courses. The card is good for 1 year and cannot be renewed. This means the cardholder can carry basic site work since he has complied with the health and safety standards and has carried out basic site skills. Issued to modern apprentice or skilled worker with Level 2 S/NVQ, or a skilled worker with no informal apprenticeship or have not yet received any formal qualifications but has previously obtained SKILLcard through industry accreditation. Valid for 3 years, this card is developed for those who are not able to get an industry Accreditation (also known as the grandfather’s rights) and have no formal industry qualifications. Must be registered for Level 2 or 3 S/NVQ and has a complete S/NVQ profile with an assessor. This gold card is a renewable card that is good for 5 years. It can be obtained by skilled workers with N/SVQ Level 3 or has an indentured apprenticeship or has an informal apprenticeship and SQA or City & Guilds advanced craft certificate holder that is based on your trade. For the blue card, a worker must be a skilled one with Level 2 N/SVQ or has an informal apprenticeship and has a City & Guilds craft certificate according to your trade. On the other hand, a gold card will be issued to a skilled worker with Level 3 S/NVQ, or has an indentured apprenticeship or has an informal apprenticeship with City & Guilds or SQA advanced craft certificate appropriate for your trade. This renewable card is valid for 3 years and costs £40.00. It is also suitable for registered operatives who are competent enough to handle refrigerants. This card is intended to cover ancillary work related to heating, ventilating, air conditioning and refrigeration contracting industry. Operatives have no full S/NVQ nor any identified S/NVQ units. This Gold Supervisory card is suitable for Foreman, First Line Supervisor, Junior / Assistant Project Engineer who recently completed a student apprenticeship and Senior Commissioning Engineer. Operatives should also have an S/NVQ Level 3. This dark green skill card is valid for 3 years and can be renewed thereafter. This is suitable for occupations related to heating, ventilating, air conditioning and refrigeration contracting industry with no S/NVQ or the operative is qualified for another specialist field whose work is only a minor part of the overall job. This card is available for managerial occupations such as contracts manager, commissioning manager, design engineer, project engineer, project manager, quantity surveyor and service and maintenance manager. This is ideal for Building Service Engineer with corporate membership standards of the Chartered Institution of Building Services Engineer (CIBSE) and is able to provide proof that he is maintaining a Continuing professional Development (CPD). One can choose from either a Regular Site Visitor who is not directly involved in construction, maintenance or planning operational activities; or an Occasional Site Visitor which is intended as an aid to contractors in controlling personnel in the site. Take note that for all categories, a SKILLcard health and safety test must be taken as a minimum requirement and will be made a part of the application. How do I apply for a SKILLcard?